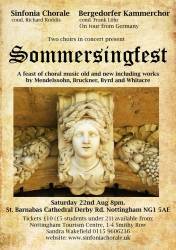 Sinfonia Chorale are looking forward to welcoming the Bergedorfer Kammerchor and their conductor, Frank Löhr, to Nottingham. We are delighted that they are coming to Nottingham for the “return match” and we are sure they will enjoy the exciting programme of events which has been arranged for them. On Thursday August 20th, they will be giving a lunch time concert in the Chapter House at Lincoln Cathedral from 1.10pm to 2.00pm. 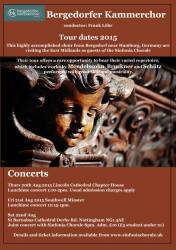 There is no charge for this concert but normal admission charges to the Cathedral will apply. On Friday August 21st, they will perform in Southwell Minster from 12.15pm to 1.00pm as part of the Minster’s regular Lunch time series. There will be refreshments available for the audience in the South Transept, with sandwiches at £1.50 and cold drinks at £1. Admission is free but there is a retiring collection. 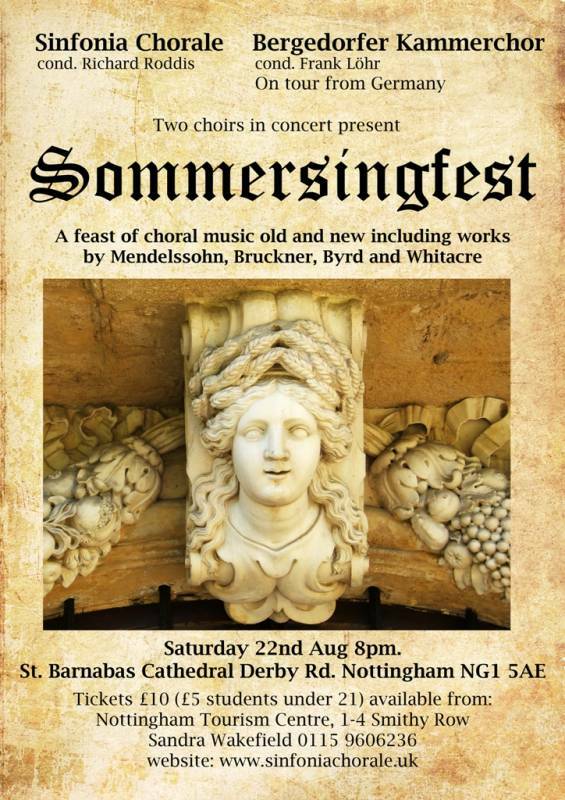 It will be an exciting programme including works by Schutz, Mendelssohn, Distler and arrangements of some Northern German Folk Songs by Hellmut Wormbächer. The Sinfonia Chorale will be singing works by Weelkes, Holst, Larley and Whitacre and the two choirs will join forces to sing Bruckner's Locus Iste and Cecilia McDowell's Ave Regina.